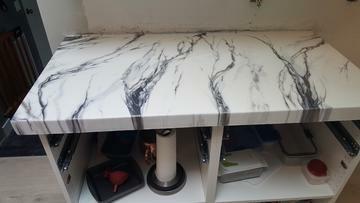 Hand-poured faux carrara style white marble epoxy countertop over a client's DIY concrete countertop in Beaverton Oregon. 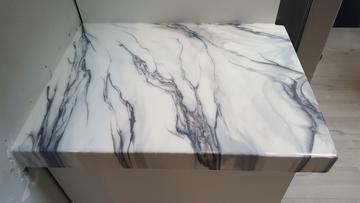 Titanium and gunmetal veining/accents. Hand-poured faux Carrara style white marble epoxy countertop over a client’s DIY concrete countertop with titanium & gunmetal veining/accents. 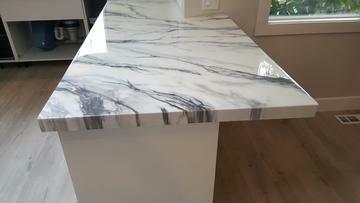 Beaverton, Oregon…The Armortech crew recently wrapped up this faux carrara white marble countertop project for some new clients in Beaverton. The clients had DIY’ed the concrete countertop and had originally intended to apply a clear sealer, but changed their mind, after applying the sealer; and decided instead to go with a faux white marble look. After making several samples and nailing down the exact look the client was hoping to achieve, we got to work at removing the clear sealer and making a few minor repairs to the surface. 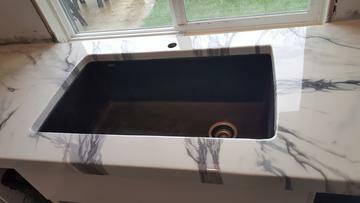 After which we applied a solid white base coat, and poured two decorative coats of metallic epoxy to achieve the prominent titanium veins and the deeper, more subtle "carrara-esque" gunmetal ghost veining. 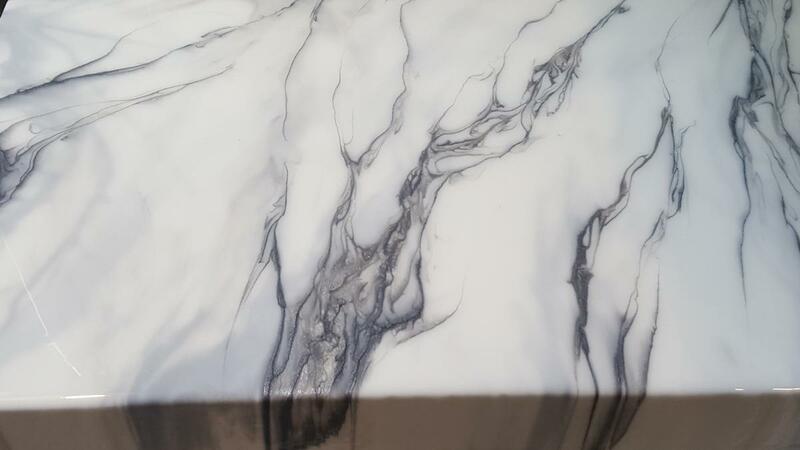 Wish your countertops looked like this? Or, maybe you have your own custom design in mind? 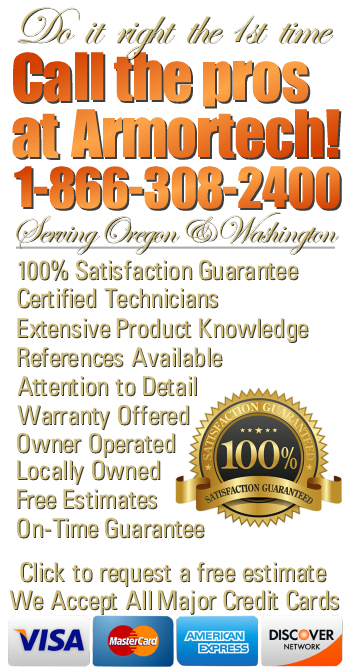 Call the pros at Armortech, the Northwest's trusted epoxy countertop contractor. One-of-a-kind copper metallic epoxy floor with coffee, brass and charcoal pearl highlights. Custom P-LAM epoxy bar top made for a retro themed bar & lounge in Portland, Oregon. Surface restoration and refinishing is not just what we do, it is our passion and our craft. And, it is our dedication to our craft that allows us to approach each project with enthusiasm and a desire to provide the highest level of craftsmanship each and every time. Prior to establishing Armortech Resurfacing, the two founders honed their craft, and accumulated decades of experience working for others in the construction industry, including one of the top land-based flooring contractors in the country. 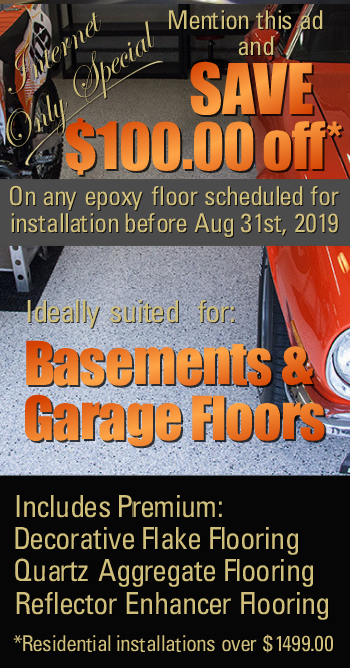 Over those years, they not only mastered the multitude of techniques and procedures required to expertly apply a variety of epoxy products to many very different surfaces. They also gained the project management skills needed to successfully run multiple teams of skilled tradesmen and laborers for an interior design firm servicing some of the biggest names in the cruise line industry, in drydocks from the Europe to the Bahamas. After reaching the proverbial glass ceiling, they decided to break out on their own and formed Armortech Resurfacing, Inc. with the vision of bringing their decades of expertise working with specialty coatings and seamless epoxy flooring to their community, friends, and neighbors. We look forward to the opportunity to earn your business and are confident our meticulous attention to detail, dedication to quality craftsmanship, and service will make us your first choice when considering a specialty coatings contractor. 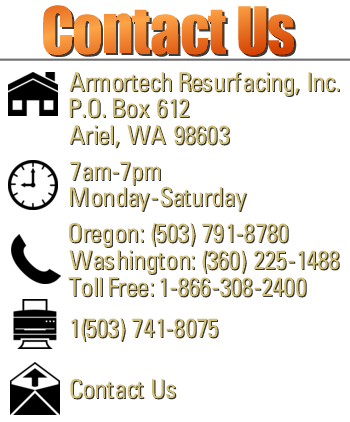 Armortech Resurfacing, Inc. operates in Oregon & Southwest Washington. Our service area includes the greater Portland Vancouver metro area, all the way to the North Oregon Coast. And, extends from Portland to Beaverton, Hillsboro to Lake Oswego, Vancouver to Longview Kelso, Woodland to Ridgefield, and everywhere in between including Astoria, Warrenton, and Seaside. Copyright © 2019 Armortech Resurfacing, Inc. All rights reserved.